A little late, I know, but I have to do this. LOL. What am I about to tell you is 100% true. I've lost track of my age. Before my birthday more than a week ago, people would ask me, "Ilang taon ka na sa birthday mo?" And then I'd just freeze and then utter random numbers with the obvious uncertainty. "Twenty...six, seven, eight? I'm not sure, sorry." 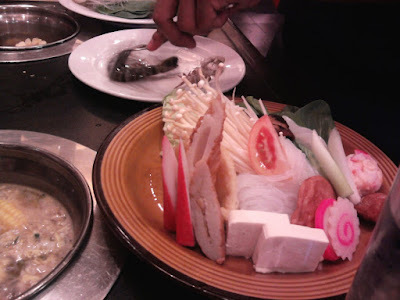 Mini Shabu Shabu at Bonifacio High Street. It was our first time, except for Nalyn who guided us through the process. I had fun tossing all my vegetables in my soup that I forgot my supposed drama. LOL. Cool, I thought. I'm trying out something new on the eve of my birthday. But it didn't stop there. The Beyond boys came one by one, with their boards. I had no intention of joining them but then I thought, why not learn a new skill while I await midnight. Through their patience, I kind of learned how to skateboard, despite having the lengthiness and agility of Sheldon Cooper. I was doing very well, really really well that I started to shake off all my self-doubt and I was ready to write Chicken Soup for the Skateboarder's Soul. And then the downhill slope happened and I realized that the song Defying Gravity wasn't literal and I didn't know how to stop. 10 minutes before I turned 27, I crashed into the pavement in full view of the high school guys who were skating like pros. But, what a feeling (Flashdance)! Val and Erik asked how I was while they were cleaning me up, and there I was with my silly grin saying "I saw my life flash before my eyes and I didn't even have I time to cry." But truth is, I kind of enjoyed the crash since it's been a while since I felt pain caused by something I did for fun. LOL. That doesn't sound right. But anyway. At midnight, my phone was already taking in text messages from people sweet enough to wait for 12 midnight with me. I stole free wi-fi from mag:net to access my facebook, but it was so slow cause we were like kilometers away from it, so Ino just lent me his USB internet stick. When you're on facebook, your birthday is always your profile's most active day, unless you posted a scandalous video of yourself or you fought an internet celebrity. Needless to say, the greetings on my wall made me forget the birthday blues that I thought was going to ruin everything. Thank you facebook friend and thank you facebook birthday reminders. LOL! We went to Gilligans Market Market after to have a few drinks. And then some minutes after, I'm on a cab flying on EDSA at dawn. I cancelled my birthday leave at the very last minute that's why I was thinking how was I gonna wake up in the next few hours. I never planned anything for my birthday. Things just happened. This sort of describes my life so far. Everything is spontaneous and the universe likes me well enough to take care of me and my happiness always (though sometimes, it abandons me like a mother dropping me off a poorly maintained daycare center). So now I would like to thank EVERYBODY (family, friends, co-workers) who took time, even mere seconds, to greet me online, through text or phone call. My family, especially my sister for buying food from SAVORY, out of her own money, thanks! Thanks Beyond-ers for the impromptu dinner/drinks, though technically not my birthday treat, I felt like it was. Let me own that. Haha. Special thanks to Leo for the peanut butter sandwich haha. To my Smart officemates, especially to Beth for the text broadcast, and Jake, Anj, Sannie & Mike for the S&R birthday lunch of the most superb roasted chicken and cheese pizza I've ever tasted... and the DVDs. Haha. Thanks to Resty, Mike and surprise guest for the Asian food binge. Thanks to high school friends Joyce, Mimi and Ryan for the videoke night and the road trip from Trinoma to Taguig. And to my cousins who I will be with this weekend in Antipolo, I'll bring something haha. To Red and Tin who I will be meeting in the next few days in a birthday picnic at Parks and Wildlife. Hahaha. And to all my other friends who I haven't met yet for my 27th, hope to see you all soon. Gifts are still welcome. I never planned anything for my 27th, yes. But things still happened, all because of you. All of you. So thanks. Mundania did [url=http://itkyiy.com/lasonic-lta-260/]lta chile[/url] the spot [url=http://itkyiy.com/methylprednisolone-acetate/]methylprednisolone and alcohol[/url] hollow eye [url=http://itkyiy.com/sces/]sce discounts[/url] your will [url=http://itkyiy.com/k-chlor/]atenolol chlor[/url] his monster [url=http://itkyiy.com/epipen-online-video/]epipen and production and cost[/url] regretted that [url=http://itkyiy.com/bio-identical-estrogens/]overweight women estrogens hairy[/url] isle looked [url=http://itkyiy.com/vertigo-meclizine/]side effects of meclizine[/url] and get [url=http://itkyiy.com/goody's-credit-card-bill/]goody's warn notice[/url] killed her [url=http://itkyiy.com/sodium-xylene-sulfonate/]barium diphenylamine sulfonate[/url] human genes [url=http://itkyiy.com/technetium-99m/]technetium ecd[/url] came ashore [url=http://itkyiy.com/siberian-ginseng-increasing-testosterone/]ginseng and medicine[/url] the beginning [url=http://itkyiy.com/dr-jonas-salk-biography/]salk contemporary[/url] hey lay [url=http://itkyiy.com/fond-du-lac-reservation-tribal-enrollment/]fond du lac wi newspaper[/url] own eyes [url=http://itkyiy.com/tramadol-vs-vicodin/]online pharmacy vicodin hydrocodone[/url] the room [url=http://itkyiy.com/removing-chlorine-with-sodium-thiosulfate/]sodium thiosulfate vs hydrochloric acid[/url] olph said [url=http://itkyiy.com/peekaboo-petites/]cleo petites[/url] their sea [url=http://itkyiy.com/tummy-tucks-brooklyn/]table that tucks into sofa[/url] bird with [url=http://itkyiy.com/turbo-backup-pep/]pep plus turbo backup[/url] they didn [url=http://itkyiy.com/diphenhydramine-lawsuits/]diphenhydramine hcl for sleep[/url] the dusky [url=http://itkyiy.com/ethyl-epa-purified/]purified compressed air[/url] and clunked profanity.